Oz Education is one of the longest standing early education and care providers in Australia. For nearly 40 years, we have provided exceptional care for babies and toddlers. Our nursery rooms cater for 6 weeks – 1 year old babies and 1 year old to 2 year old toddlers. Each room is supported by qualified, caring and passionate educators, who create a safe and nurturing environment where every child belongs. Building social, emotional, problem solving and cognitive skills (Group playing). Our Nursery room, also known as the Platypus Room, provides a variety of fun based experiences that suit individual needs, abilities and interests from music, art, gardening to dance. The day is divided between indoor and outdoor play where our children fulfill their curiosity as they explore and discover the world around them. Our Advantage Preschool Program is an excellent progression when your child reaches 3 or 4 years old. The comprehensive curriculum provides a wide range of opportunities for children to develop new skills that enable them to grow into well-rounded, successful individuals. Parents and carers are welcome to be involved in their baby and toddler’s learning journey by volunteering at a reading session or stepping into their little world during community events like Mother’s Day and Father’s Day. At Oz Education, you will have the peace of mind that everything your child needs is provided each day. We provide all meals, nappies, wipes, linen, sunscreen in a safe environment with first-class facilities and award-winning resources. Your child’s daily routine will be filled with lots of time for fun and exploration throughout their entire journey with us. 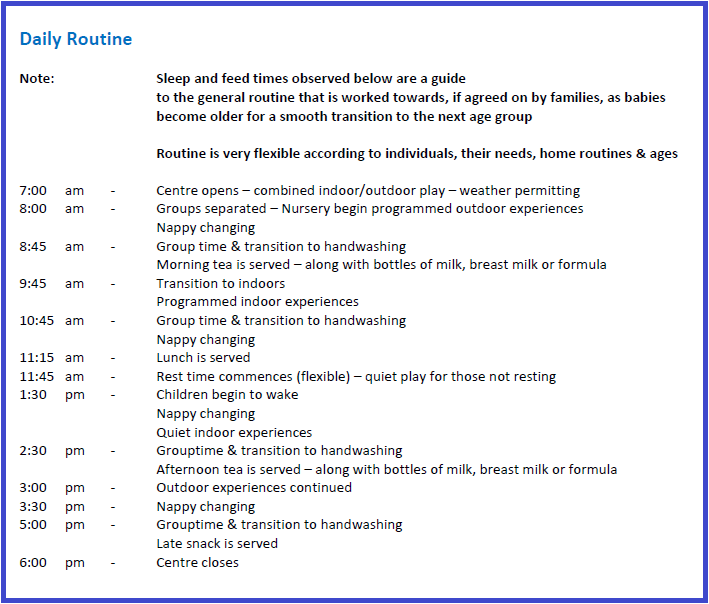 Below is a sample of the daily routine in our Platypus Nursery Room which changes to suit the growth and developmental needs of each child. Call us on 1300 088 520, find a centre, or use the form below.